Glad you had fun!! You look terrific! You look fantastic. Great job on the weight loss. Hope little Owen is feeling better soon. Poor Owen, I’m assuming he was bitten by another kid and not some creature lying in wait? Hi, Kathleen, The shawl is lovely and so are you. Good job with the weight loss, too. Now it’s time to knit another lace shawl…….you are getting good at this so don’t stop now! I haven’t known you for long and I don’t know you well, but for whatever it’s worth I think you look absolutely beautiful. Dang it girl – you look MARVELOUS! What a fun goal for the reunion. 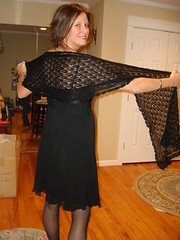 The shawl is to die for and I hope you’ll be wearing it to many wonderful reunions. I had a similar encounter at my reunion with a girl who was often teased. I think she enjoyed the reunion more than anyone! Katy, you look FABULOUS. Such a pretty woman!!! I’m sure you turned thier heads. What bit Owen? a peer? or an animal? Hi Katy! You look fantastic! The shawl and dress and lovely! Your knits were always great! I remember you from when I used to knit regularly and I decided to look you up. You are still pretty and sweet and so is that shawl! Keep knitting!! Hope 2009 brings lots of blessings to your family! Just checking in. You’ve been quiet for so long… I hope all is well.